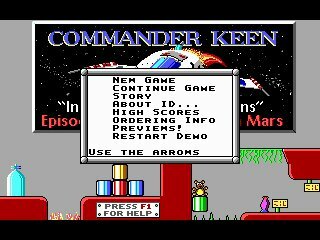 Released in December 1990 by Apogee and developed by id Software, Commander Keen: Marooned on Mars is the first installment of the Commander Keen series. While Commander Keen is exploring Mars, the Vorticon steal four vital components of his ship and hide them in Martian cities. The Commander is forced to take action. Best time: Single-segment 0:03:52 by Arturs 'Xarthok' Demiters on 2013-02-07. 3. Treasury: Jumps were more accurate than average. Did miss one pogojump after the second keycard but it only cost a couple frames. 4. Capital City: Unfortunate luck with yorp behaviour as clearly visible but in the end it only cost about a second. The rest went fine. 5. Emerald City: Jumps were more accurate than average but could be better still. 6. Ice City: Close to optimal, a rare occurance. 7. Vorticon Commander's Castle: The run killer robot was dodged pretty optimally, the rest went very well too. Not much else to say, sub 3:50 is certainly possible but would take ages to get.